California Common Cause supported fair redistricting with Measure DDD on Long Beach’s November 2018 ballot. 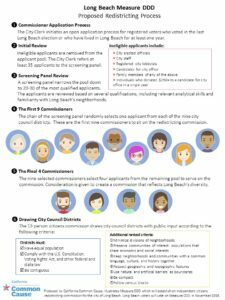 Voters in Long Beach voted to pass Measure DDD, giving residents a meaningful voice in choosing their representatives and ending the gerrymandering of City Council districts once and for all. Redistricting is required after every census to ensure that districts have equal population, but it’s like letting the foxes guard the henhouse when politicians control the process. The temptation to put personal political interests ahead of citizens’ right to fair representation is simply too strong. The current system turns democracy on its head by letting politicians pick their voters, when it should be voters selecting their politicians. The charter amendment ends the conflict of interest in which City Council members draw their own districts by stripping them of that power and creating an independent citizen redistricting commission. Political insiders need not apply for the commission because recent elected officials, candidates, lobbyists, donors, and their close relatives will be barred from serving on the commission. This reform will also bring redistricting out of the shadows by mandating public hearings across the city and prohibiting private communication about redistricting with commissioners and staff. Strict rules for drawing City Council districts will focus on keeping neighborhoods together and ban the drawing of districts to advantage any politician or political party. With the passage of Measure DDD, Long Beach will give citizens a true voice in our democracy by implementing one of the strongest redistricting reforms in the country. The charter amendment will create a citizen-led redistricting process that will empower a broad cross-section of residents without ties to the City Council to draw districts that put the needs of our communities first.